How will rising unemployment affect property markets? The Bureau of Statistics’ figures for June show Australia’s unemployment rate has risen to 6 per cent, despite almost 16,000 jobs being added. So what does this mean for our property markets? 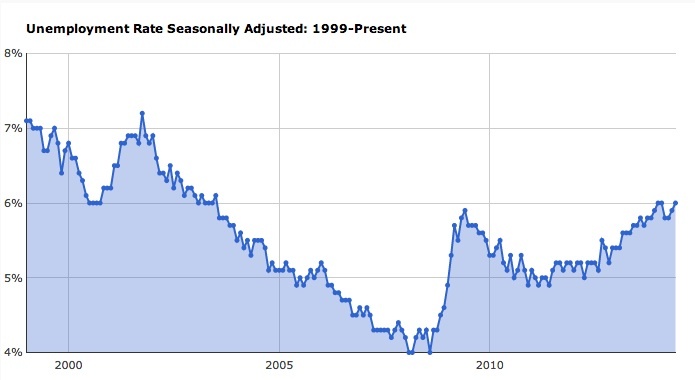 Well…unemployment is up from 5.8 per cent where it had been for several months. Job creation slightly beat most economic forecasts, however, of the total 15,900 jobs added, 19,700 were part-time and were offset by a fall of 3,800 full-time positions. When you dig deeper into the figures the proportion of people in work or looking for it rose 0.1 percentage points to 64.7 per cent, contributing to the rise in the unemployment rate, in spite of jobs growth. NSW: Unemployment steady at 5.7 per cent; participation up from 62.9 to 63 per cent. Vic: Unemployment up from 6.2 to 6.5 per cent; participation down from 64.4 to 64.1 per cent. Qld: Unemployment up from 6.2 to 6.3 per cent; participation steady at 66.3 per cent. SA: Unemployment up from 6.9 to 7.4 per cent; participation up from 62.1 to 62.9 per cent. WA: Unemployment steady at 5 per cent; participation up from 68.3 to 68.4 per cent. Tas: Unemployment steady at 7.4 per cent; participation up from 60.9 to 61 per cent. NT: Unemployment up from 3.8 to 3.9 per cent; participation steady at 75.7 per cent. ACT: Unemployment steady at 3.6 per cent; participation down from 71 to 70.8 per cent. Source: ABS. All data seasonally adjusted, except Tasmania, NT and ACT which are trend, due to small sample size. The high unemployment rates in South Australia (7.4%) and Tasmania (7.4%) don’t bode well for their local property markets. In other states, some sectors of the property market will suffer more than others, especially blue collar suburbs as Australia changes from being a manufacturing nation to more service and retail oriented. The overall figures suggest interest rates will remain at their current low levels for a while longer and even have some commentators suggesting we may get another stimulatory rate cut to help bring the unemployment levels down.